Don’t let the title get your hopes up, cause it’s not actually coming back. Never even heard of “The Daily Matt?” Well if that’s the case let me quickly bring you up to speed. 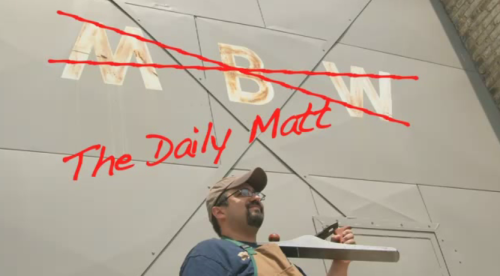 The Daily Matt was a short-lived show I started producing six years ago this month. At the time there was a lot of talk in the online woodworking community about how awesome it would be to have a daily show devoted to woodworking, and I couldn’t let everyone down could I? NO I COULDN’T! So I accepted the challenge and drove that idea as far as I could take it, which apparently ended up going as far as 86 episodes before I ran out of gas. So while I’m out enjoying the summer weather and unintentionally ignoring my shop for long periods of time, enjoy these episodes. Hopefully I don’t contradict myself too much!